Walter George Don played a single game for Carlton in season 1913, before turning out in 15 games at University the year later - the only Blue registered to have ever also played for University. A blonde-haired, blue-eyed half-back flanker from Shepparton, Don was recruited by Carlton from Teachers Training College. He was included in the senior team for the first and only time in round 18, 1913, against Fitzroy at Princes Park. Also in the team that day was another debutante who was destined to play just once for the Blues; Les Starr. Les and Don had much in common, in that they were both trainee school teachers from country towns, and both were destined to be wounded in action while serving their country in war. 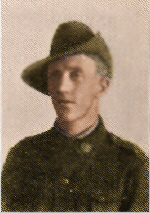 Shortly after the outbreak of World War 1 in August 1914, Wally Don enlisted. He sailed for Gallipoli with reinforcements for the 6th Battalion in June 1915, and shortly afterward was promoted to corporal. In August of that year, amid some of the hardest fighting of the whole campaign, he was seriously wounded by an exploding artillery shell. He was evacuated to hospital in England for specialist care, where his treatment and recuperation took more than two years. While recovering from his wounds, and with an eye to returning to his teaching career, Don was given leave to study at London’s University College. He eventually rejoined his Battalion - on light duties - in March of 1918, and was repatriated back to Australia in November. Just days after his return an armistice was signed, and the bloodiest of all wars was ended. Don passed away on the 1st June, 1957 aged 65. Contributors to this page: WillowBlue , Jarusa , molsey , pblue , Bombasheldon , PatsFitztrick , tmd1 and admin . Page last modified on Tuesday 06 of May, 2014 09:05:17 AEST by WillowBlue. 1988 Prelim. Final - Match Preview.